- Rule a) For "ANY" act to be accepted it has to be in accordance to the Sunnah and for Allah alone . Without these two if you stand and pray for 80 years it won't be accepted. # 1 : Do not stop at the black stone (Hajr aswad) line/mark to point and raise your hands for more than a second max. # 6 : Not throwing packets or dropping food drops, your hair after combing on the carpet and prayer region. Especially date seeds. In my recent trip to Haramain shareefayn, i happened to see a lot of things , simple small acts opposed to the sunnah, done by the people which causes big grievances. I decided to come back home and pick those points and share the sunnah solutions for them. So without further a-due i'l begin with the article. Rule a) For "ANY" act to be accepted it has to be in accordance to the Sunnah and for Allah alone . Without these two if you stand and pray for 80 years it won't be accepted. جاء عن هؤلاء قولهم : ( لا ينفع قول إلا بعمل ، ولا عمل إلا بقول ، ولا قول وعمل إلا بنية ، ولا نية إلا بموافقة السنة). حدثنا أحمد بن إسحاق ، ثنا عبد الرحمن بن محمد ، ثنا عبد الرحمن بن عمر قال : ذكر عند عبد الرحمن بن مهدي قوم من أهل البدع ، واجتهادهم في العبادة فقال : " لا يقبل الله إلا ما كان على الأمر والسنة " . ثم قرأ : ( ورهبانية ابتدعوها ما كتبناها عليهم ) فلم يقبل ذلك منهم ووبخهم عليه ، ثم قال : " الزم الطريق والسنة " . It was narrated from Hudhaifah that: He saw a man praying (And his bowing and prostration) were lacking (i.e he wasn't doing it properly as the prophet taught). Hudhaifah said to him: 'For how long have you been praying like this?' He said: "For forty years.' He said: 'You have not been praying for forty years and if you die praying like this, you will have died following a path other than the path of Muhammad (sallalahu `alayhi wa sallam). Then he said: 'It is possible for a man to pray briefly (shortly/quickly), but still do it properly." The Third and Final Proof - Pay attention and FEAR ALLAH! It is reported that the prophet (sallalahu `alayhi wa sallam) said “ There is nothing that will take you closer to Paradise but that I have enjoined it upon you, and there is nothing that will take you closer to Hell but that I have warned you from it." Some of the people of knowledge have stated that whoever does a sin in Makkah, then he will have a painful torment because of the magnitude the belongs to Makkah, even if one doesn’t end up doing the sin. This is the opposite of what one may do outside the Haram, as sins outside of the Haram don’t carry the same level of severity. It has been narrated that ‘Abdullah bin Mas`ood [May Allaah be Pleased with him] said, “If someone even intends to do a sin within the Haram then know that that the severe torment is applied to him.” This has been authentically narrated from Ibn Mas’ood. Sinning includes whatever falls under a sin. Looking at the bust of women, pushing others during tawaaf or sai, lying and cheating, not respecting the elders, fighting and bad mouthing, smoking , laughing loudly or talking loud enough to disturb others and etc. Good deeds as mentioned by the prophet sallalahu `alayhi wa sallam include everything that is good islamically, even smiling at your brother . For example, helping lift the elderly their bags, guiding someone to the door of the Haram or the quickest way to reach the Mataf, or where he can pray without rush (such as the terrace from King fahad gate) ; serving your friends Tea , doing dhikr and encouraging them to indulge in dhikr more and time pass less and etc. The prophet sallalahu `alayhi wa sallam and other sahaaba and even till the last century many people did tawaaf on their mounts such as camels . The idea of stopping at the Hajr aswad is only for kissing it but not during/for pointing at it . People should follow the sunnah and simply raise their right hand, pointing it towards the black stone, say bismillah Allahu akbar and move on immediately. Standing there to kiss the hand after pointing, rubbing the hand on your body, standing there pointing for 5 minutes and making du`a - all of this is not from the sunnah. Due to these oppositions to the sunnah, a lot of traffic is created at that starting point eventually either causing the unwanted rubbing and touching or men and women, or pushing of old people. "What about you and your meetings on the paths? Avoid these meetings on the paths. " and in another hadeeth : "Avoid sitting in the pathways (of people)"
Avoid sitting on the paths. They (his Companions) said: Allah's Messenger. there is no other help to it (but to sit here as we) hold our meetings and discuss matters there. Thereupon Allah's Messenger (ﷺ) said: If you have to sit at all, then fulfil the rights, of the path. They said: What are their rights? Thereupon he said: Keeping the eye downward (so that you may not stare at the women), refraining from doing some harm to the other and exchanging mutual greetings (saying as-Salamu 'Alaikum to one another) and commanding the good and forbidding the evil. Do not abuse your freedom by extending your sitting to half an hour or 20 minutes chit chatting and making du`a while disturbing and blocking the flow of traffic for millions others. People unfortunately spread their Musallah/praying mats, spread their legs and sit there like it's a garden for picnic disturbing the traffic flow . What reward is there by standing on top of someone and making du`a? Does it make sense? Then how can you purposely block the traffic of the mataaf and make du`a harming and troubling everyone else? Please do not sit in the pathways of safa marwa, the mataaf regions and maqaam e ibrahim. Manbudh b. abi Sulayman narrated from his mother that she was with Aisha the Mother of the Believers when one of her handmaidens came in to see her and said: Mother of Believers, I went around the Ka'ba seven times and touched Hajr al-Aswad twice or thrice!. Aisha (ra) replied: May Allah not reward you! May Allah not reward you! You shoved your way through the men? Could you not have (pointed with your hands and) said "Allahu Akbar" and kept going? "Did you slap this man on the eye, Oh Abu al-Hasan?" He said: “Yes, Oh Amir al-Mu’mineen.” Umar said: “Why?” He said: “Because I saw him staring at Muslim women during tawaf.” ‘Umar said: “Well done, Oh Abu al Hasan! ولما وقع في عهد عمر رضي الله عنه شيء من اختلاط الرجال بالنساء في الطواف نهى أن يطوف الرجال مع النساء، فرأى رجلاً معهن فضربه بالدرة. ( رواه الفاكهي في أخبار مكة(484).). When `Umar (ibn Khattab) r.a used to see men and women mixing during the tawaaf, he would forbid them from it. And when he saw a man (walking or doing tawaaf) inside their circle/with them he would whip him. When `Aisha radhiallahu `anha asked the Messenger of Allah sallalahu `alayhi wa sallam about wanting to go for Jihaad , he sallalahu `alayhi wa sallam replied the Jihaad of the women is the Hajj and `Umrah. Likewise, entering into the heavily crowded by men area, purposely knowing fully that there will be touching, pushing, rubbing and much more like hitting , how can one even allow his women folk, let alone drag them along inside to those regions? The prophet sallalahu `alayhi wa sallam only touched the ruk yemeni. He did not kiss it and neither did he raise/point his hand towards it nor did he stand there making du`a. (see Shaikh Ibn Uthaymeen’s Al-Sharh al-Mumti’, 7/283 for details). May allah reward with goodness and protect the authorities indulged in helping and always improvising the provisions for the hujjaj in Makkah and Madeenah. They have now (in 2014 or even before) started plastic bags every 5-10 feet. Free plastic bags specifically for your slippers. Please use them to cover your slippers in and then keep them in front of you or others while praying. Many people keep their bare slippers having dirt and filth on it right beside you or above your head while praying. Ya salaam. Take a plastic bag with you ya akhi. The prophet sallalahu `alayhi wa sallam said the reward for removing harm from the road is charity and it made someone enter paradise. He sallalahu `alayhi wa sallam also said there is no harming and no reciprocating harm. Please follow the sunnah of hygiene wherein he sallalahu `alayhi wa sallam said hygiene or cleanliness is half of emaan. Mothers and families who bring food should also bring a small plastic spread usually spread on the floor. Throw your waste and date seeds and qahwa powder in your trash bag , not in and around the masjid. In al-Saheehayn it is narrated that Anas said: The Messenger of Allaah (sallalahu `alayhi wa sallam) said: “Spitting in the mosque is a sin and its expiation is burying it.” Narrated by al-Bukhaari, 415; Muslim, 552. Al-Nasaa’i (728) and Ibn Maajah (762) narrated from Anas that the Prophet (peace and blessings of Allaah be upon him) saw some sputum (belgum) in the qiblah of the mosque and he got so angry that his face turned red. Then a woman from among the Ansaar came and scratched it and put some perfume in that place. The Messenger of Allaah (peace and blessings of Allaah be upon him) said: “What a good deed this is.” This hadeeth was classed as saheeh by al-Albaani in Saheeh al-Nasaa’i and Saheeh Ibn Maajah. Again, pushing harming, jumping is all a sin. If you find sufficient space to pray quickly two rak`ah after tawaaf in line with the maqaam e ibraahim, well and good. If not please go back and pray anywhere. Follow the sunnah for this is what the prophet and his sahaaba taught and preached. Unless for a genuine reason, you ought to go to the haram much before so as to find a decent spot to sit and pray, such as the terrace or the basement from the king faisal and fahad gate. Everyone knows that approx 1 hour before any salah they close the inner gates due to over loading of pilgrims. Yet many people out of lazyness or time pass hurry to the haram only after or when the adhaan is very near. Please go early , and save the hitting and standing on the hand, shoulder, palms and shoulder of each other and praying due to lack of space. You have paid good money to be there, why waste your time in the markets and hotels? The outer gates or region of the haramain do not have zam zam water for wudu mostly, then why do you have to leave the house/hotel without wudu, go there and further jam the traffic and increase the queue for wudu? why not follow the sunnah, do the wudu from your hotel room and come directly? The Prophet (peace be upon him) said:“ Whoever purified (made Wudu) himself in his house, and then walked to one of the Houses of Allah (Masjid) to perform an obligatory Salat, his footsteps act as one lowering a sin and the other raising a reward” (Muslim). Ya ikhwan, the reward for praying in the basement is the same as on the terrace and beside the ka`bah . Please do not let your own logic and superstitious beliefs or mood swings cause more trouble than already for the people there. It only accumulates more congestion. The terrace and basements are so big and almost empty, why rush to the lower region always? During Sai` (between safa and marwah) the rush on most months of the year isn't that much as for the tawaaf. Why do you still have to use the pathways or lines secluded for the elderly and old? Why not use the normal ones designated for men and women? May allah reward the authorities of the haramain and their workers, how much they run and work to keep the bathrooms and pathways clean for us, yet we see people instead of shaving in their hotel rooms come and shave here. They use the toilet like some jungle bathroom and leave it in a very despicable manner. they don't turn off the water taps, they don't even bother putting the water pipe back where it was, rather they throw it on the floor down for the next person to come pick it up that way. `Audhubillah ! Likewise throwing, spilling water like hooligans straight from the JUNGLE in the ablution regions. when you clean your nose or wash your food filled mouth, have some common sense, if not manners to wash it away properly before leaving your spot. Being lazy or not bothered could also constitute to sinning inside the haram as you are on purpose without a genuine reason harming others who are waiting in queue to use your bathroom or abulution spot. more-so, this should not be done right in the center of the tawaaf circles as some do. Because these regions are the most congested. to take some dates or drink from your glass people will stop MID WAY in their tawaaf thereby blocking a huge group behind. 1) what about the obligation of praying properly like doing the rukoo` and sujood perfectly without which the salah is invalid? will catchin this jam`at standing on one feet enable you to do your rukoo` properly? 2) what about the inevitable rubbing and touching of men with the women while they go into sujood together while standing on each other's feet? How will the salah be proper? Many people push and also shout others to push those in front of them on the escalator or stairs thinking this will fasten the speed of the traffic. What craziness is this? How many people fall and hurt themselves due to this? they bleed because of such acts and wallahi this is a big sin. Many people indulge in group jokes and chit chats thereby disturbing others who recite qur`an, or want to take a quick nap or are praying. And ash-Shafa`ee responded to the saying of the one who said, "There is nothing from the house (ka`bah) that is abandoned" with (the response) that: We have not left touching the (two corners) out of abandoning the house, and how can a person be abandoning it when he is making tawaf around it. Rather, we follow the Sunnah both in performance (fi`l) and abandonment (tark), and if not touching them both constitutes abandoning them, then not touching what is between the corners would also be abandonment of it, yet there is no one expressing this [view]. Even if you do kiss the ka`bah, yet do it momentarily not for hours and not hanging on to it, shouting wailing, sweating on it. This is against the sunnah. Emotions and loud crying don't get your prayers answered, following the Messenger of Allah does. I don't know how can someone be doing tawaaf and at the same time be playing with his facebook or phone. Or send business meeting messages . The sin of harming others in this is by slowing the traffic. Your pace of walking and focus is on the mobile. Which affects the flow behind. Many people keep their eyes fixed towards the Hajr aswad, despite being (metaphorically) 500 miles away from it. the administration of haramayn - may allah preserve and reward them greatly in both the worlds - have taken every minute step to ensure ease for the hujjaj. So those at the outer circle , far from the hajr aswad end up starting their rounds either early or late mostly because they cannot analyze the exact position of the hajr aswad and thus end up raising their hands to say Bismillah allahu akbar either before the actual position of the stone or after it. A simple solution is to look at these green markers fixed on the two rings of the temperory mataaf rings as seen in the image. 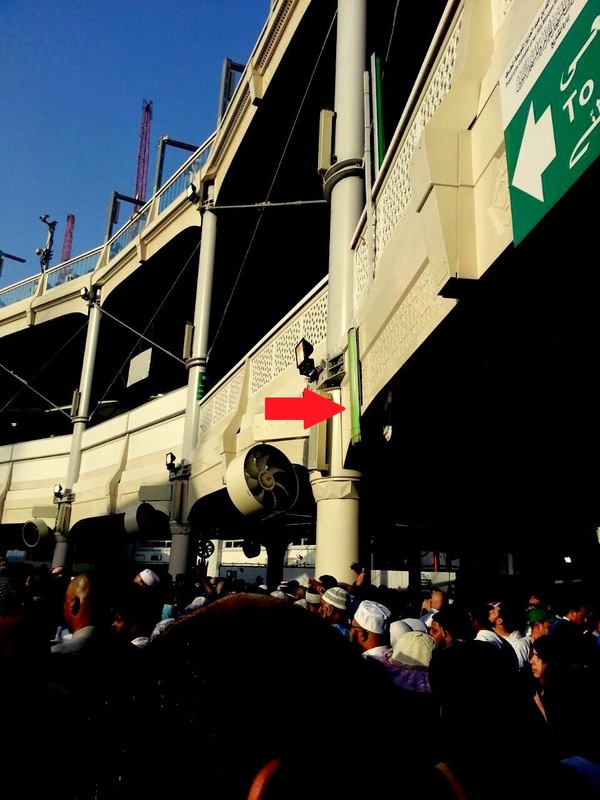 these green markers are exactly parallel to the hajr aswad and thus helps those on the outer circle to be accurate in their starting the circuits. More to come In sha allah. If you have some ways you want me to add in this article, please leave a comment barakallahu feekum. This wording is from Sunan Abi Dawood. Another one in Ibn Majah has "do not confuse us"
Following the sunnah in the haramain especially will give you two rewards.